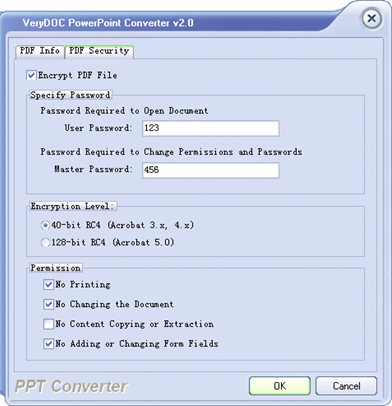 The demo version of VeryDOC PowerPoint Converter does add a watermark into the created Flash, PDF, and PS files. After you are convinced that the program fits your needs, you are strongly encouraged to purchase and register your copy of the software by acquiring a personal unlock key. In your evaluate period, you may click "Try" button to try this software. 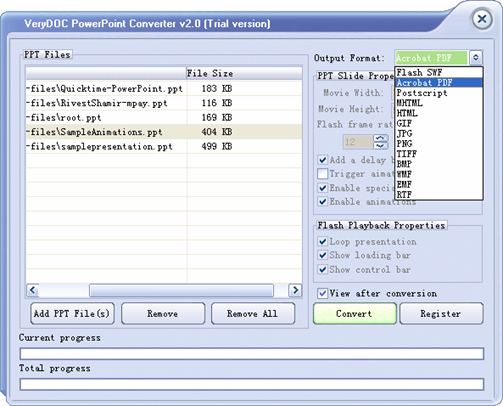 Output Format: Flash SWF, Acrobat PDF, Postscript, MHTML, HTML, GIF, JPG, PNG, TIFF, BMP, WMF, EMF, RTF. Move Width: Set width to Flash file, default is 720. Move Height: Set height to Flash file, default is 540. Flash frame Rate: Select a FPS speed at which your slides will be played after conversion. For example, if you select 12fps, the Flash file will be played at 12 frames per second. Add a delay between slides: Check this option if the final playback speed of the converted swf file(s) is too fast and if there is no delay between the slides in the original PPT file. Trigger animation by mouse: Check this option if you want each animation to appear on a mouse click and disappear on the next mouse click. 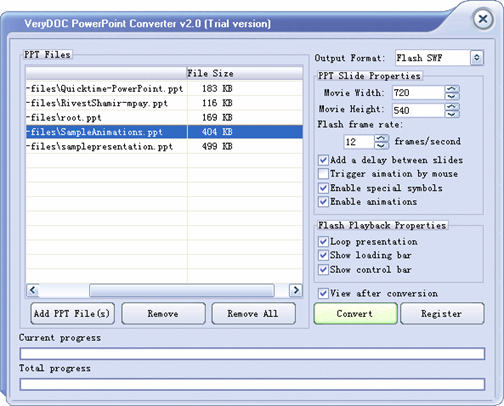 Enable special symbols: Enable or disable special symbols during PowerPoint to Flash conversion. Enable animations: Check this option, all the animations and transitions in your PowerPoint files will be kept after conversion. Uncheck this option, your PowerPoint slides will be showed in static without motion effects. Loop presentation: Check this option if you want to loop your presentation automatically. Show loading bar: Show or hide loading bar when in SWF file. Show control bar: Show or hide control bar in SWF file. View after conversion: View created files automatically. 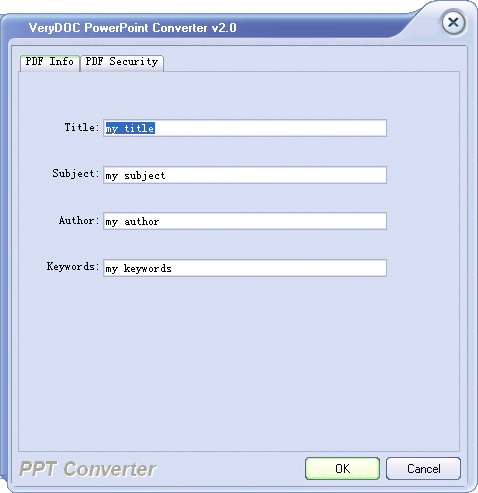 Add PPT File(s): Add PowerPoint files into file list for conversion purpose. Remove: Remove selected PowerPoint files from file list. Remove All: Remove all PowerPoint files from file list. 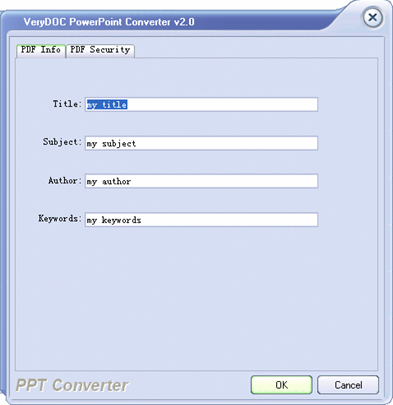 Convert: Begin convert PowerPoint files. 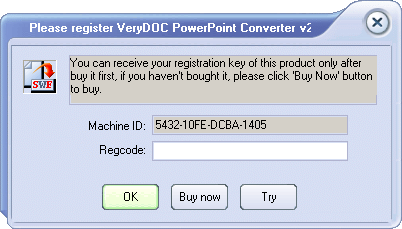 Register: Register VeryDOC PowerPoint Converter software. 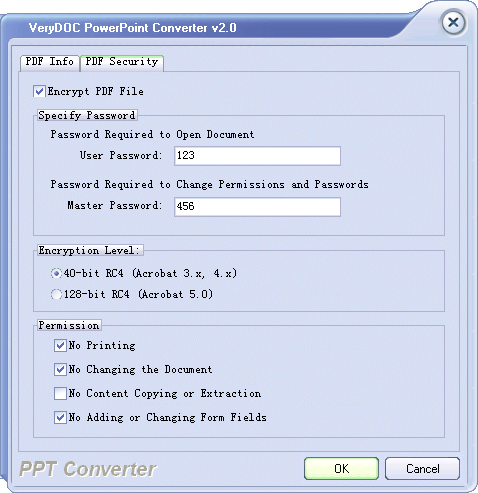 Encrypt PDF file: Check this option if you wish add permission to PDF files. Specify Password: To set the user password and master password according your need. With user password, you can only open the document, and master password ( also called owner password) to change permission and passwords. Encryption Level: Choose 40-bit or 128-bit according to the version of Acrobat software. 40 and 128 are the length of the encryption key in bits. Permission: To set the usage restriction to those who have user password. No Printing: You can read the document but not allowed to print it. No Changing the Document: You can read the file without permission to edit it. No Content Copying or Extraction: Not allowed to select a block of the file to copy to the clipboard. No Adding or Changing Form fields: Not allowed to modify forms in the file. pptconv.exe C:\in.ppt C:\out.pdf -subject "subject"